The outstanding event of 1908 was the Quebec Tercentenary. The three hundredth anniversary of the founding of Quebec by Champlain was to be celebrated in part by a huge military review, [over 13,000 soldiers]. H.R.H. the Prince of Wales, later King George V, was to take the salute. The Toronto Brigade, [QOR, 10th Royals, and 48th Highlanders], was invited and gladly accepted. The Queen’s Own had to be limited to one battalion of ten companies. 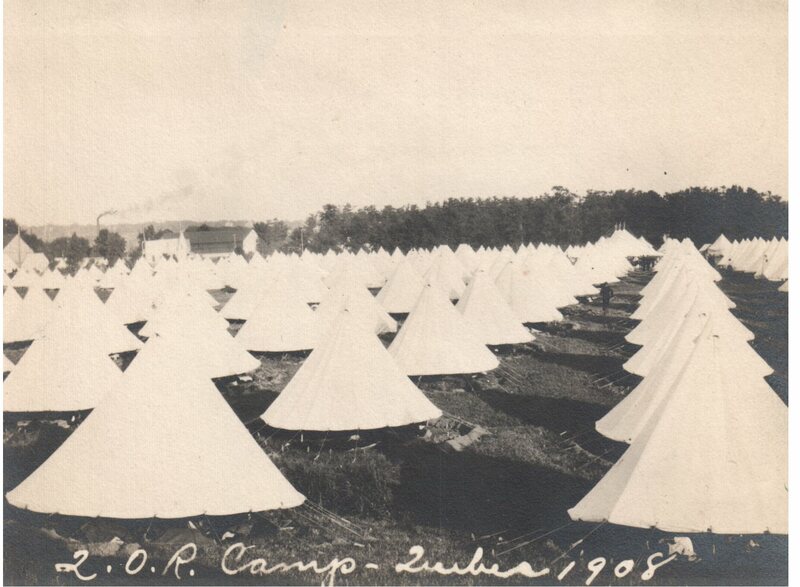 The brigade left Toronto on 19 July and were accommodated in tents at West Savard Camp. 21 July was given over to a rehearsal of the ceremonial. 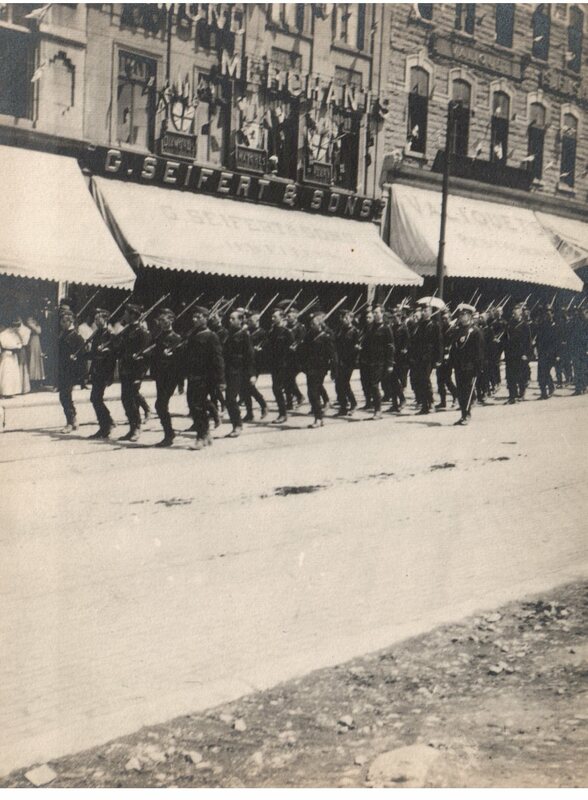 H.R.R the Prince of Wales arrived on 22 July and The Toronto Brigade, helped line the streets of Quebec. A second rehearsal was held on 23 July; and once again the streets were lined as the Prince drove to unveil a monument in commemoration of the Tercentenary. The review proper was held on 24 July. Field Marshal Lord Roberts as Honorary Colonel led The Queen’s Own past the saluting base. Colonel Sir Henry Pellatt followed with the regiment giving a magnificent performance in the quick alert pace of a rifleman. The flashing silver of the swords and badges against the rifle green uniforms conveyed, as one observer said, “a tremendous feeling of solidarity”. It is worthy of note that “0 Canada” achieved wide popularity at the Quebec Tercentenary; not as a substitute for the National Anthem but as a song indicative of the pride Canadians felt in their own country. The original French words were written by Sir Adolphe Basil Routhier; the music was composed by Calixa Lavalee. Many English versions of the words were offered. Amongst these was one by Brigadier-General Laurence Buchan, CMG, whose service in The Queen’s Own started in 1866 as a boy in the Upper Canada College Rifle Company and continued until 1882. Today, the most familiar English version is that composed by Judge Robert Stanley Weir in 1908. Afterwards, Lord Roberts met the officers of the regiment and complimented them on the fine showing that the regiment had made. The Field Marshal was particularly interested in the fact that all officers had served at least a year in the ranks and thoroughly approved the idea. Though contrary to British custom, he was wise enough to see that this procedure was particularly suited to the Canadian concept of democracy. He also knew that many men of breeding and education were to be found serving as riflemen. One can imagine what a reinforcement his concurrence with QOR views would have received could he have looked into the future of Lt. Charles Vincent Massey who enlisted 15 April, 1907, as a rifleman, and was destined to become our first Canadian Governor General.